A narrow alley and a green door seen in the maze of alleys in downtown Ostuni. 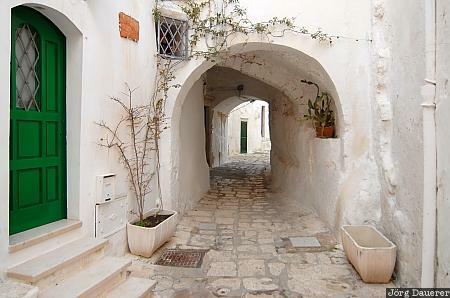 Ostuni is one of the white cities (Citta Bianca). It is located in Apulia (Puglia) in the province of Brindisi in southern Italy. This photo was taken in the evening of a sunny day in early May of 2006. This photo is part of the exhibition The color Green (February 2009). This photo is the image of the month in April of 2019. This photo was taken with a digital camera.